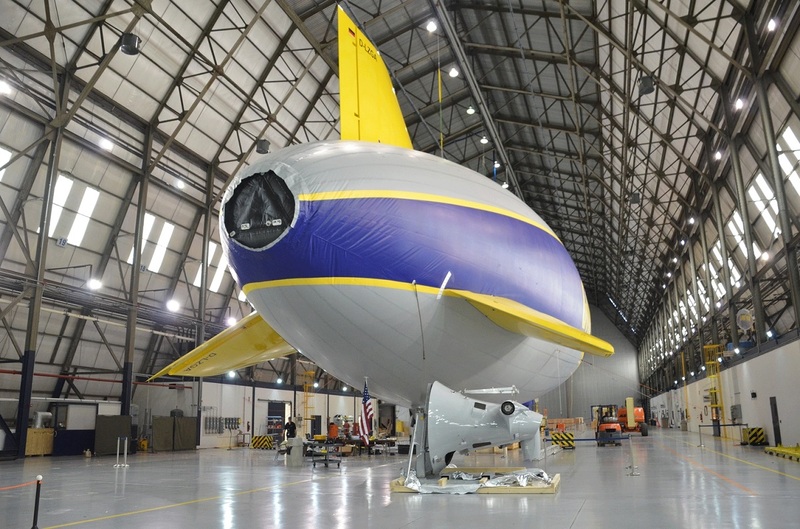 Later this month, Goodyear will launch its newest airship, the 246-foot, 10-ton Wingfoot Three, out of a hangar in Akron, Ohio. It’s a big deal, and not just in the literal, bigger-than-most-jumbo-jets sense. Goodyear’s newest airship, the Wingfoot Three, being assembled in a hangar near the company’s Akron, Ohio, headquarters. Since this June 1 photo, the airship’s engines have been installed in preparation for its launch later this month. It’s the culmination of a seven-year effort to break from the company’s century-long tradition of blimp-making and to adopt sleek, modern airships designed by Germany’s Zeppelin conglomerate. In short, Goodyear is getting out of the blimp business. The most impressive part? 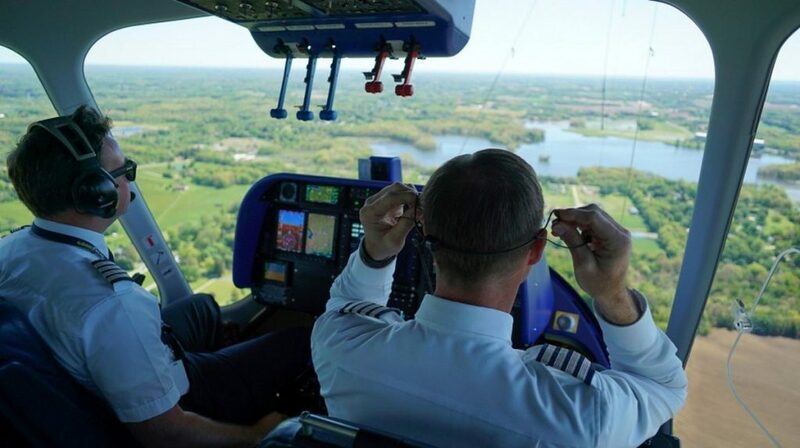 Goodyear has undertaken the biggest U.S. airship-pilot training program since World War II. And that’s huge, because airships are tricky — even veteran pilots need a year or more to learn the ropes. Very few of them have. Only 128 people are qualified to fly airships in the U.S., according to the Federal Aviation Administration. Aside from contractors and experimental pilots, we count that about 17 of them are paid to do it full time. And 13 of them fly for Goodyear. 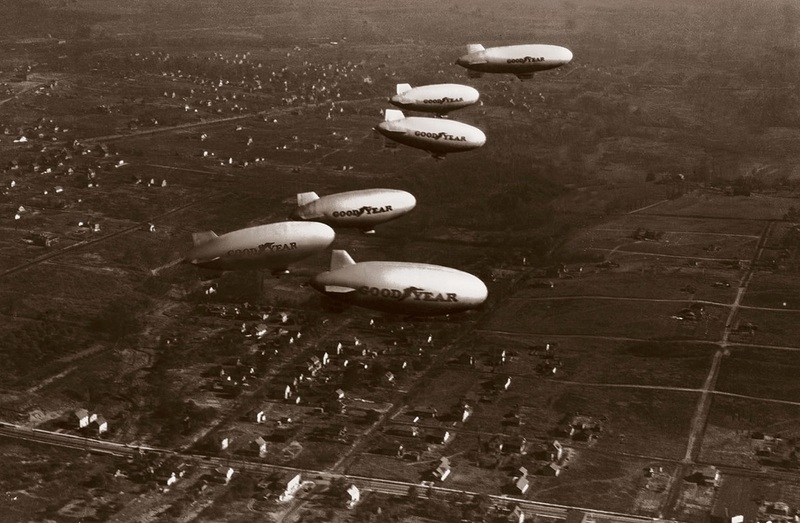 The others fly for AirSign, which has operated the blimps advertising MetLife and DirecTV. AirSign operates only one ship at present, but it has 14 other blimps and a pool of trained pilots on standby. There are always a couple dreamers on the fringe, but the modern airship business is the ad business. Blimps are glorified billboards that double as the smoothest aerial camera platforms around. It’s the basis of a symbiotic relationship: Goodyear and AirSign provide aerial shots of live events, and in exchange broadcasters shout out their blimps on air. 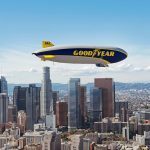 Goodyear’s second Zeppelin NT airship, Wingfoot Two, flying over Los Angeles on Nov. 8, 2017. The new ships are as big as a Boeing 747 and at least as difficult to fly. So when Goodyear moved away from homegrown blimps to honest-to-goodness Zeppelins, it had to retrain most of the nation’s full-time airship pilots. The Zeppelins are made by a descendant of the company that brought the world the Hindenburg, but don’t panic. They haven’t filled airships with flammable hydrogen for about 80 years. These days, blimps (vast rubberized envelopes that get their shape from the gas inside) and Zeppelins (semi-rigid airships with an aluminum and carbon-fiber skeleton) are both lifted by helium. 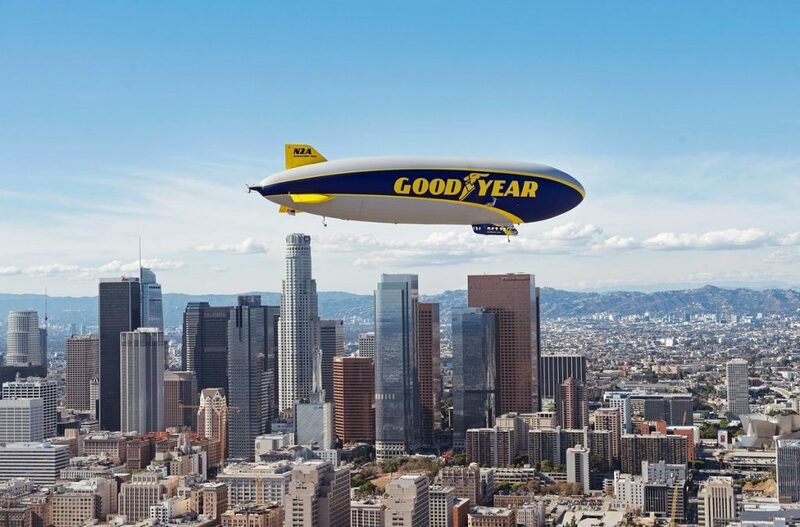 In a triumph of public relations over pedantry, the company refers to its new Zeppelins as “Goodyear Blimps,” rather than the more accurate “Goodyear Semi-Rigid Dirigibles.” We’ve followed their lead and relaxed our language somewhat as well. Tiremaker Goodyear had been building airships since 1911. It sold hundreds of blimps and balloons to the armed forces during the world wars, but it hasn’t exactly been a growth industry in the years since — until last year, it was still using a model of blimp that first flew in 1972. Six Goodyear blimps fly in formation in November 1930. The large airship at the top of the photo, Defender, became the first blimp to carry an electronic sign that same year, according to Goodyear historian Eddie Ogden. It made sense to ditch the legacy blimps. The faster, more maneuverable Zeppelins provide smoother coverage of more events. They don’t lose as much expensive helium during operation. They’re also bigger, which means they can carry twice as many passengers and provide more billboard space for the tire and rubber company. Training is overseen by Goodyear’s chief pilot, Michael Dougherty, the only person in the country that the FAA has designated as a pilot examiner for airships. A patient, even-keeled blimp virtuoso who goes by the nickname Doc, Dougherty studied aviation at Kent State University and spent three years flying 50-seat airliners for Continental Express. He joined Goodyear in 2007 and earned his stripes on the company’s old blimps. Keeping those plodding sky-boats trim against the elements was a constant, physical battle. Steering a blimp required maneuvering a seat-mounted wooden flight wheel and the pedals, knobs and cables that controlled the engines and the flow of air in the huge gas compartments above. It was so taxing that Dougherty and his peers often spelled each other every hour. 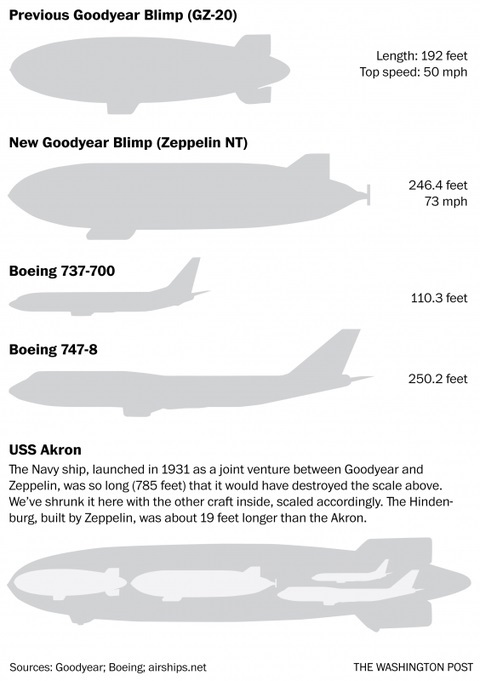 With the new Zeppelins, which cost a reported average of $21 million each, airships are catching up with eight decades of aviation technology. Pilots sit behind a modern avionic dashboard and twiddle control sticks to direct advanced, swiveling engines. In a welcome advance in an industry where flights often exceed eight hours, they also have onboard bathrooms. To learn them, Dougherty earned a special German pilot license and spent hundreds of hours flying tourists around Lake Constance and along the Rhine River for a Zeppelin subsidiary. Dougherty runs a rigorous, multi-step version of flight school — without the flight simulators. There’s no point. It’s impossible to simulate the atmospheric mayhem that remains an airship pilot’s primary opponent. Airships lack the predictable routes and powerful autopilot in much of commercial aviation. Goodyear Chief Pilot Michael Dougherty lifts his earpiece off during a May 2017 training flight with William Bayliss over Akron, Ohio. As a result, airship training can’t be rushed. You can teach someone to fly a single-engine plane in 10 to 15 hours, AirSign chief executive Patrick Walsh said. But, as 63-year-old chief pilot Terry Dillard said, it takes 250 to 400 hours before an airship pilot can go solo — even if the FAA requires only 50 hours of experience before your official examination. Goodyear’s Dougherty hires veteran airline, helicopter, corporate and bush pilots — people who can handle aircraft and public relations. His competitors at AirSign prefer hot-air balloon or helicopter pilots. They like to make sure their pilots are ready to spend months or even years living out of suitcases as they putter across the country in the biggest, slowest mobile billboards money can buy. This entry was posted in Airships, Dirigible, Semi-Rigid and tagged airship, AirSign, Akron, blimp, Blimp NT, goodyear, Goodyear blimp, Mike Dougherty, Wingfoot Lake, Wingfoot One, Wingfoot Three, Wingfoot Two, zeppelin. Bookmark the permalink.